The bad bugs on the team were to identify ways E. coli can enter a dairy farm and cause mastitis in the dairy cattle. The good guys were to identify biosecurity measures that should be implemented on the dairy farm at critical points to protect the dairy cows from the harmful bacteria. A lively exchange between the bad bugs and the good guys ensued during the 15 minute presentation. Each side was well-prepared and ready to rumble. The bad bugs began the dialogue by enumerating all of the points of entry at which they would attack, and they challenged the good guys by daring them to state what they were going to do about it. The good guys quickly responded by pointing out their plan for stopping the bad bug in their tracks. 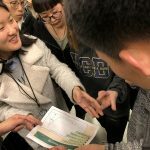 The Good Guys vs. Bad Bugs learning exercise was part of the 3-week NAU-UC Davis Education Conference on One Health for Food Safety and Security, held at UC Davis, January 22 – February 9, 2018. 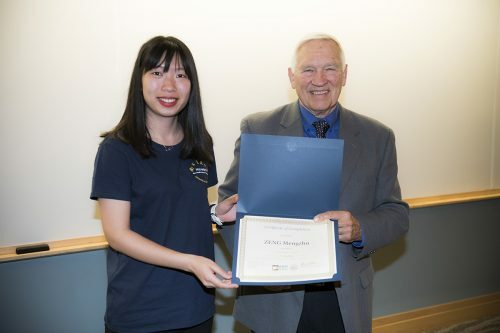 Twenty-nine undergraduate students from Nanjing Agricultural University (NAU) attended the conference sponsored by NAU, and hosted by the UC Davis School of Veterinary Medicine’s Western Institute for Food Safety and Security (WIFSS). Ronny Bond, a water quality researcher and field cooridnator with WIFSS, instructs NAU student on how to take a soil sample for analysis of pathogenic microbes, during visit at ARS Field Station. Joining the Davis Warriors in the learning exercise were the teams of Shield, Return of the King, and FELPAB, (an acronym for Food, Ecology, Life Sciences, Plant, Animal and Biology). Each team brought unique perspectives to their assigned Good Guys vs. Bad Bug scenarios which, in addition to the dairy problem, included a Salmonella foodborne illness outbreak originating from a poultry farm, a norovirus outbreak in a college dormitory, and Cryptosporidium contaminating strawberries. 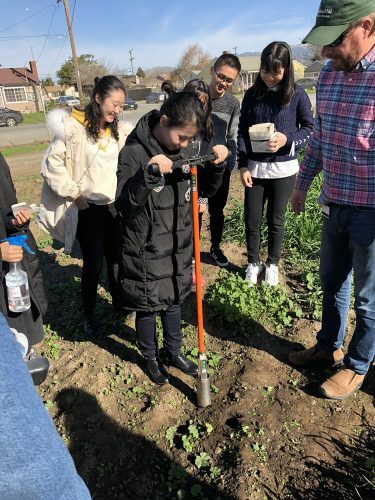 The combined teams involved students from seven different colleges from Nanjing Agricultural University encompassing Life Sciences, Food Science and Technology, Resources and Environment Science, Plant Protection, Animal Science and Technology, Veterinary Medicine, and Horticulture. 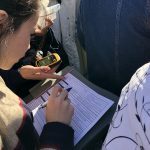 The learning exercise was in preparation for a 4-day field trip which included visits to the USDA Agriculture Research Station in Salinas, CA, and a large dairy in the Central Valley. The strawberry fields at the research station brought to life the discussions that had taken place earlier in the classroom when they talked about water serving as a vehicle for Cryptosporidium contaminating a strawberry field. At the visit to the dairy they saw first-hand how a dairy operation takes steps to address nutrition, manage waste, and ensure food safety. The pre-trip exercise was useful for a productive learning experience on the field trip. 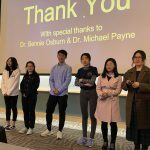 The students soon realized the benefit of integrating the breadth of knowledge from their different fields of study in completing their hypothetical scenarios. The combination of the in-classroom learning exercise and the field trip facilitated seeing the bigger picture and recognizing the way in which working together they can investigate a foodborne illness outbreak and create prevention plans to lessen the chance for future outbreaks. The three-fold mission of the WIFSS’ One Health conferences includes raising awareness, team building, and a call to action. Understanding the role of the environment, people, and animals in a complex problem requires an acute level of awareness. 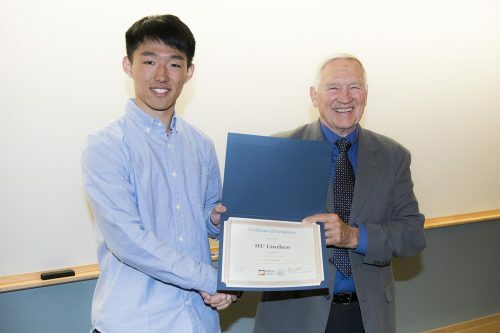 Students explored methods of problem solving in addressing possible real-world scenarios such as limiting the opportunity of E. coli from entering as a contaminant into a dairy, stopping Salmonella from contaminating potential food products derived from poultry, eliminating Cryptosporidium contamination in strawberries, or containing a norovirus breakout in a dormitory. Each piece of the curriculum, including lectures, group discussions, field trips, team building exercises, and final presentations, combines to raise awareness of the One Health triad and how the health of people, animals, and the environment, are inextricably connected to each other. Our curriculum encourages teamwork through collaborative group projects. 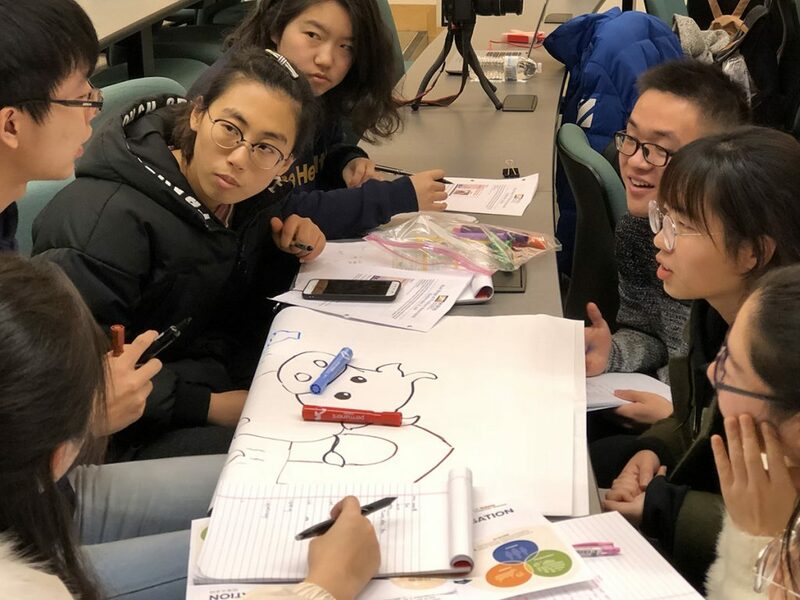 Students take an interdisciplinary approach using the One Health model to solve problems related to food safety and security. This is the generation that will reduce the threat of foodborne illness, which impacts 600 million people each year, and causes 420,000 deaths, of which 125,000 are children. Under the tutelage of WIFSS’ faculty, staff and affiliates, students absorb new knowledge, and gain confidence in expressing their opinions. Facilitating team group efforts were Bennie Osburn, Director for Outreach and Training, Michael Payne, Dairy Outreach Coordinator, David Goldenberg, Food Safety and Security Training Coordinator, Heather Johnson, Instructional Systems Designer, Jin Wang, visiting professor from Jiangsu Vocational College of Agriculture and Forestry, and Dr. James Cullor, a professor emeritus in the Department of Population, Health and Reproduction at the School of Veterinary Medicine. Team presentations given on the final day of the conference showcase what the groups identified as their number one food safety or environmental issue in China. Factors they see as combining to cause the problem are presented, along with the multi-disciplinary strategy they would use to solve the problem. Several short-term solutions are proposed, as well as long-term solutions that could be used to address the problem. Presentations are concluded with a call to action to the audience. Each team included a short video in their presentations on the final day and you can view all four videos HERE. As a sample,enjoy this video from Return of the King. The groundwork for the future of One Health in China is cultivated in the activities offered in our One Health conferences. The foundation for bringing about a safe and secure global food supply begins by educating the next generation. By immersing students in our One Health curriculum we provide a powerful model for team-work and problem solving. Through concerned and enthusiastic leadership from renowned professors from across the UC Davis campus, subject matter experts, and staff, we plant the seeds of imagination for discovering the solutions to leading environmental and food safety issues. Students embrace the principle that building partnerships and working together across multiple fields of study, with varying levels of expertise, serves as the course for change. Friendships forged at the conference continue back home when they join the NAU Student One Health Club and continue to address multiple environmental and food safety issues together.